The last time raw materials like copper and oil were this cheap, an economic depression loomed just around the corner. It's no secret that commodities in general have had a horrendous 2015. A nasty combination of overflowing supply and soft demand has wreaked havoc on the industry. 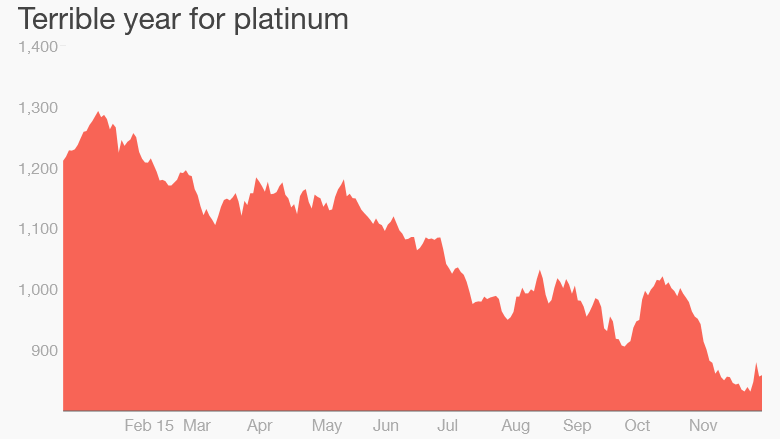 But prices for everything from crude oil to industrial metals like aluminum, steel, copper, platinum, and palladium have collapsed even further in recent days. 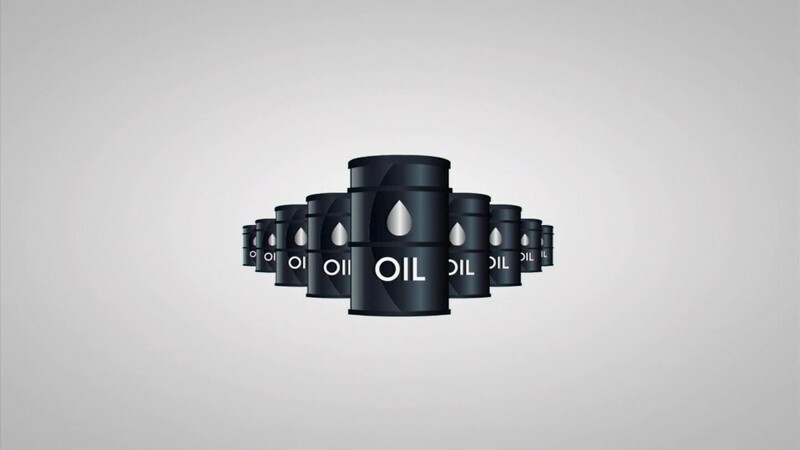 Crude oil crumbled below $37 a barrel on Tuesday for the first time since February 2009. The situation is so bad that this week the Bloomberg Commodity Index, which tracks a wide swath of raw materials, plummeted to its weakest level since June 1999. "Sentiment is horrendous. It's the worst since the financial crisis -- and it's getting worse every day," said Garrett Nelson, a BB&T analyst who covers the metals and mining industry. There was fresh evidence of the sector's financial stress from De Beers owner Anglo American (AAUKF). The mining giant said it was suspending its dividend and selling off 60% of its assets, which could lead to a reduction of 85,000 jobs. The commodities rout is knocking stock prices, with the Dow falling over 200 points so far this week. It's also raising concerns about the state of the global economy. "Markets are in the midst of another global growth scare," analysts at Bespoke Investment Group wrote in a recent report. Soft demand is clearly not helping commodity prices. China and other emerging markets like Brazil have slowed dramatically in recent quarters, lowering their appetite for things like steel, iron ore and crude oil. More developed markets don't look great either. Europe's economy continues to underperform, Japan is barely avoiding recession and U.S. manufacturing activity contracted in November for the first time in three years. But the real driver of the recent commodity crash is on the supply side, compared to the collapse in demand during the Great Recession. 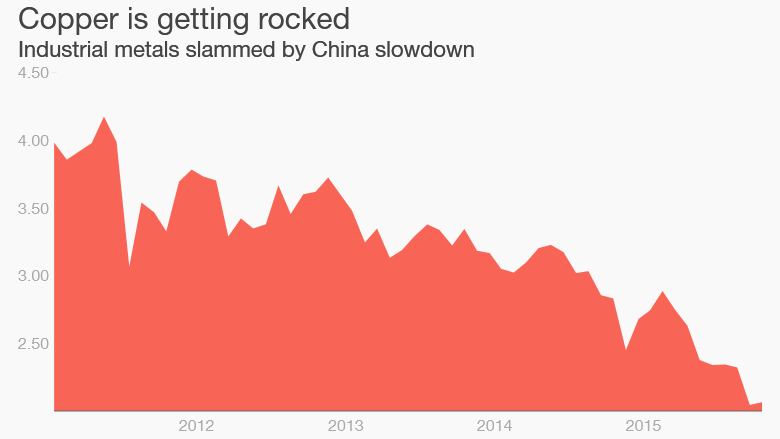 Cheap borrowing costs and an inability to predict China's slowdown led producers to expand too much in recent years. Now they're flooding the market with too much supply. "There's a lot of froth and excess production capacity that needs to go away permanently. It's hard to imagine we're not in a low-commodity price environment for a fairly long time," said Nelson. That means you should brace for more plant closure and announcements like the one announced by Anglo American. In the U.S., roughly 123,000 jobs have disappeared from the mining sector, which includes oil and energy workers, since the end of 2014, according to government statistics. It's also likely some companies won't survive the depressed pricing environment. Financial trouble for commodity companies have already lifted global corporate defaults to the highest level since 2009, according to Standard & Poor's Ratings Services. "We're entering into a period of severe distress," said Nelson, who pointed to "dramatically deteriorating" credit metrics for metals and mining companies. Jeffrey Kleintop, chief global investment strategist at Charles Schwab, said he's concerned about more defaults. "It's something that has kept us out of high yield and that will continue into 2016," he said. At some point, though, commodity stocks will have to stop falling. The S&P 500 energy sector has lost 23% of its value this year alone. Many stocks are trading at relatively cheap valuations. But (so far at least) few investors have the courage to buy amidst all the chaos in this space. "There may be a buying opportunity in the next year or two -- but we might not be there just yet," said Kleintop.